A few years ago I bought the first edition of this monograph. I had subscribed to Mushroom Modeling Magazine and wanted to see what they could do in terms of a monograph on a particular subject. After I received it, I swore never again. It was a hodge-podge of non-information and semi-information, and pictures of restored aircraft. I received the expanded second edition of this monograph for this review. Regretfully, I must report that it is about fifty percent more of the same hodge-podge of non- and semi-information and more pictures of restored aircraft. I will admit there is a better attempt at organization than the first edition. There is now a table of contents. The monograph begins with an explanation of Rüstsats. Generally, these are external modifications applied to the basic airframe. In car buying terms, theses are the dealer installed options; as opposed to the factory installed options, which, in the Luftwaffe, are referred to as Rüstzustand and Umbausatz. The monograph then proceeds to describe the subtypes of the 109 Gustav. The problems begin when the author tries to described each of the subtypes in what must be the fewest words possible. In the section on the G-1/2 we learn that a larger wheel was used on the G-2 in 1942 resulting in the “Beule” (bump) on the top of the wing. But what we don’t find out is that the geometry of the landing gear and wheel also changed. There is also a line drawing of a G-2 with the notation of the air vent added under the wind screen. But what we do not find out is that some G-2s had it on one side, some on both sides and some G-2s didn’t have it at all. We learn that the G-1 had a pressurized cockpit, but there is no description of the silica-gel pellets that are obviously on the canopy and windshield and no notation about the special intake scoop on the hood for the pressurization compressor. In the description of the G-5, there is only a notation on a line drawing that “[t]his small bulge was also found on the G-6.” There is no indication that the bulge was for the cockpit pressurization compressor and no warning that it was only on some, but not all, G-6s. When it comes to the G-10, an aircraft of many incarnations, there is no attempt to break out and describe any of those various incarnations. All that we are left with is a summary statement that they differed in several aspects such as engine cowl shape, oil filter size and wheel well fairings. There is a drawing of a long tail wheel equipped G-10 described as a short tail wheel G-10, there are drawing of G-10s with different tails and rudders, with and without Flettner tabs, all without any explanation or description. As for photographs, there are very, very few pictures of the 109 G in service. As to service, there is no discussion of the 109 G in service. There is a “walk-around” section, but this is once again a hodge-podge of pictures of restored aircraft. In the section on cockpits, most of the pictures are taken from a distance through a closed canopy of a restored aircraft. Finally, there are the profiles, all fifty of them, plus a couple of plane view. Nothing special here. Some of the color descriptions I find to be questionable. I simply cannot recommend this monograph to either a beginner, who would learn preciously little, or to someone more advanced, who would merely be frustrated. The problems that I have pointed out above are only the tip of the iceberg. 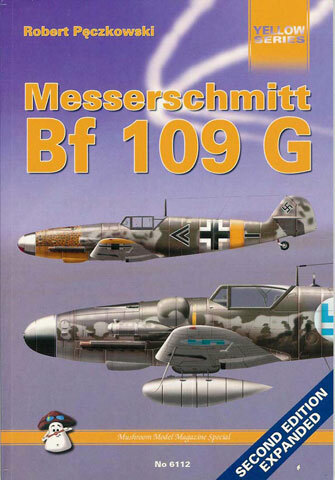 At the moment , the best overall book on the late model 109 still appears to be the Prien & Rodeike monograph, “Messerschmitt Bf 109 F,G, & K Series”.